When iconic works of art require cleaning or repair, one impulse among custodians urges extreme caution: “Don’t touch!” No conservator, for example, would be foolish enough to lighten the flesh tones, grown dark over the centuries, of the “Black Madonna” of Czestochowa, Poland’s holiest relic. Yet radical interventions can yield astonishing, even consensus-altering results for works that viewers thought they knew well. Michelangelo’s ceiling in the Sistine Chapel underwent a controversial restoration in the 1990s that not only confirmed the artist’s genius in representing the human form but revealed him as a master of color as well. In the case of “Madonna della Strada,” the cultural stakes were admittedly lower. A small painting of the Virgin and Child, it had hung for nearly 425 years in a corner of Rome’s Chiesa del Gesù, the mother church of the Society of Jesus, completed in 1584. St. Ignatius Loyola, the Jesuit founder, had venerated the image even earlier, an association that inspired a popular cult around the painting. For centuries worshippers had credited it with healing powers, though no one called it an artistic masterpiece. Time and heavy-handed retouching over the centuries had so obscured the original painting that modern scholars were puzzled over how to date it. Noting its devotional appeal, they wrote it off as a nondescript work of the late 15th or early 16th century. In 2006, when an overdue cleaning of the “Madonna della Strada” (“Our Lady of the Way”) unexpectedly turned into a bolder reclamation project, the results were startling [see cover]. The image turned out to be 200 years older than previously thought and, in terms of quality and artistic pedigree, far more interesting. The painting is first documented in the 16th century in the small parish church of Santa Maria della Strada, which preceded the Gesù on the same site in the heart of Rome and at a crossroads along the ceremonial route of the popes. A Jesuit in the 18th century claimed that “Our Lady of the Way” owed her title to the image’s original position on the exterior wall of the church facing a main street. (There is no evidence to support that theory.) In all likelihood, the little painting decorated a space somewhere inside Santa Maria della Strada. Ignatius probably first encountered it in 1540, when he preached day after day on an adjacent street corner. Within a year the pope had approved his small band of “reformed priests” as a religious order and given them Santa Maria della Strada as their pastoral home base, effectively making Ignatius caretaker of the painting. Years later in Rome, Ignatius showed equal solicitude for the “Madonna della Strada.” Before his death in 1556, he instructed the Jesuits to preserve the image and eventually to enshrine it in the new, large church he had planned for but never lived to see replace Santa Maria della Strada. When the still-unfinished Gesù opened for services in 1575, the painting was installed temporarily above a side altar. Seven years later, the Jesuits transferred it permanently to its own lavishly decorated chapel to the left of the high altar. There it remained, a direct link to Ignatius’ own devotion but cut off from its pre-Jesuit history. Until now. With the recent restoration, the image has begun to reveal some of its secrets. The first surprise came as soon as the painting was removed from its niche. Scientists from Rome’s La Sapienza University determined that the painting, previously thought to be a work on stone, is actually a fragment from a larger, now-lost fresco or a wall painting almost certainly from Santa Maria della Strada. Already detached from its original context by Ignatius’ time, the fragment was eventually transferred to canvas and affixed to a slate panel. That delicate operation, a conservation technique developed in the 19th century known as strappo d’affresco, involves peeling away the uppermost layer of paint from the fresco onto a glue-coated cloth and applying a canvas backing. After “washing” to loosen the glue, the cloth is stripped away from the painted surface, leaving the image intact on its canvas support. In the case of the “Madonna della Strada,” the canvas was attached to a piece of slate. Substantial retouching and the addition of pious accessories—gold crowns, diamond earrings and sparkling necklaces attached to the image’s surface—disguised its true appearance. The biggest revelation, however, was the Madonna herself and the infant Jesus. Working in a makeshift studio in a hidden space high above the Gesù’s lateral chapels, conservators dissolved centuries’ worth of grime, varnish, mineral deposits and overpainting from the image’s surface. Tantalizing spots of color began to peek through the murky residue. After weeks of painstaking effort, a familiar yet new “Madonna della Strada” materialized. Faces once frozen under masks of dirt and resin reappeared fresh and lively: a rosy-cheeked Christ Child, still a little Byzantine Pantocrator with his right hand raised in blessing, but now substantial and more three-dimensional, “enthroned” on his mother’s arm. The Virgin, sporting a stenciled crown, a variation on the Eastern basilissa (imperial) type of icon, is convincingly tender, with a healthy complexion, a delicately curving neck and a gaze that, like her son’s, engages the viewer. Though broken off along its bottom edge, the restored image also expresses more clearly the Virgin’s intercessory role. Her right hand, newly revealed, is directed downward, as if once she gestured to kneeling figures of patrons or other supplicants. Experts overseeing the restoration dated the work on stylistic grounds to the end of the 13th or the beginning of the 14th century. 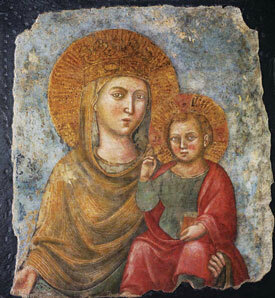 That makes the “Madonna della Strada” a relatively rare example of late-medieval Roman wall painting. A jewel, if still not a masterpiece, the restored “Madonna della Strada” will not rewrite art history. But it does belong to a late-medieval milieu that until recently remained understudied, mainly for lack of evidence. That alone makes the recovery both surprising and significant for scholars. What about the image’s modern devotees—the office workers, neighborhood residents, legions of priests and religious, retirees with grandchildren in tow, not to mention the taxi drivers and street sweepers who count this Madonna as their special patron? How do they feel about the restoration? “The response has been overwhelmingly positive,” says Daniele Libanori, S.J., rector of the Chiesa del Gesù and the principal advocate of the restoration. “Since the image was reinstalled, I can think of maybe two times when someone came asking for the Madonna, not recognizing her in the restored version.” Libanori claims a notable increase in devotion since the makeover. Liberated from its 19th-century veneer, the “Madonna della Strada” breathes freely. If more people are praying before it, it may be because the image is more available to viewers, both as a work of art and as an unobscured object of veneration. For a painting inseparable from its Jesuit associations, that is appropriate. Sensory engagement with images, real or imagined, is fundamental to Ignatian spirituality. In the Spiritual Exercises, the retreat manual written by Ignatius, the suggested meditation on Christ’s birth is especially vivid. Mary, “almost nine months pregnant, as we may devoutly think of her, and seated on a donkey,” Ignatius writes, travels with Joseph to Bethlehem accompanied by a young servant girl and an ox. The latter will complete the menagerie around the newborn Savior, foretold in the words of the prophet Isaiah (“The ox knows its owner, and the donkey its master’s crib”). The servant girl, however, is a non-scriptural figment of Ignatius’ contemplative imagination. No matter how poor, Our Lady must have had at least one servant, he reasoned. With their bold restoration, present-day caretakers of the little image have made it easier for a viewer to follow Ignatius’ advice for praying about the Nativity—that is, standing in the place of the servant girl, to “watch and contemplate” the Mother and Child as if in their presence, to imagine oneself at their service and to reflect on the meaning of this intimate encounter with God-With-Us—Emmanuel. This article also appeared in print, under the headline "Object of Devotion," in the December 21, 2009 issue. Gregory Waldrop, S.J., is assistant professor of art history at Fordham University in the Bronx, N.Y., and a specialist in the art of late medieval and Renaissance Italy.